Seems like a simple enough concept, but I cannot even count the number of times that I have told myself that things have to be perfect – the house perfectly clean, the refrigerator perfectly organized, the flowerbeds perfectly clear of weeds, the need to purchase the perfect gift, the need for my work to be perfect, the quest for perfectly flat abs (haha)…the list goes on and on. Having animals in my life, especially horses, has truly helped me to let go the notion of being perfect. The thought that I can get a 1500 pound animal to do exactly what I think it should do every single time is absurd. The thought that I will be able to ride perfectly every single time is as far fetched as me winning Publisher’s Clearinghouse. And now that I am working on new skills necessary to boost our scores at Second Level and then move on to Third Level means that I need to accept that I am now again a beginner and that mistakes will be made. Whhhaaattt?! I find it hard to explain to some of my non-riding friends that yes, even after being back in the saddle for 10 years, I am still a beginner in the world of dressage. If I really think about it, I really know very little about the sport. Collection is still elusive for Ike and I; throughness will depend on the day and Ike’s cooperative mood. Medium gaits are still a crap shoot with comments of “fast, no lengthening of stride shown” still commonplace. Turn on the haunches vexes me on a daily basis. The thought of teaching Ike flying changes is both terrifying and exciting. When you look at scoring for dressage tests, even if you miraculously received a 10 for a score, it only indicates excellence and not perfection. When I first started showing, I had a hard time wrapping my brain around the fact that scores over 60% were good. Grades like that in high school and college meant failure was imminent. Slowly and reluctantly I have learned to accept this scoring convention. So since perfection is not an option, progress is measured by the incremental changes in my scores. And thankfully, we are seeing positive changes in my First Level scores, especially when you look at the marks from this time last year. The shallow canter loops are no longer 5’s. Circles are routinely 15 meters rather than 16, 17 or 18 meters, so those scores are better. My rider scores have crept up over the 6 mark on a number of occasions. Slow and steady progress. The real progress though is not seen in my scores. On any given day, scores can be good or bad depending on the judge, the ring conditions, and the scary boogeyman hiding behind the judge’s booth. The real progress is seen in my ability to know when I have established a “7” trot, achieved a leg yield worthy of a 7.5, or produced a perfectly square halt. The ability to know a very good performance from average or a bad one is most exciting. Knowing the difference between an average trot and a show-stopping one is the true measure of my progress as a dressage rider. 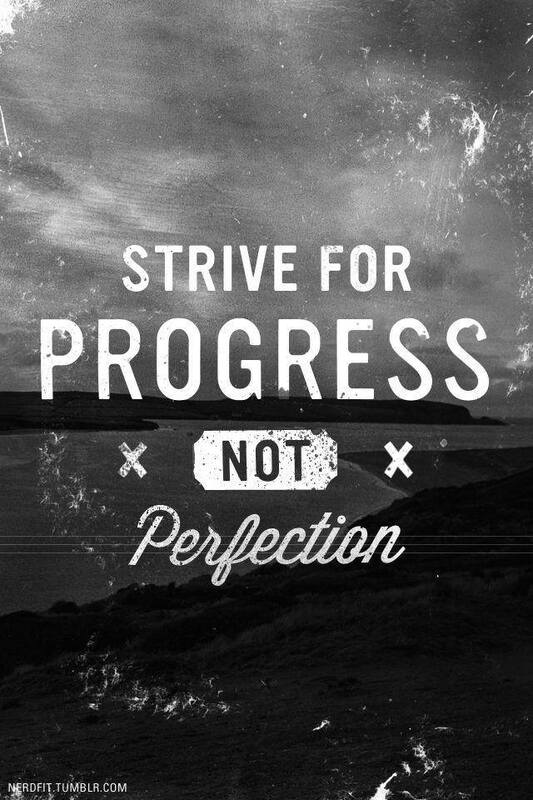 As long as we are seeing progress, I can live without perfection. 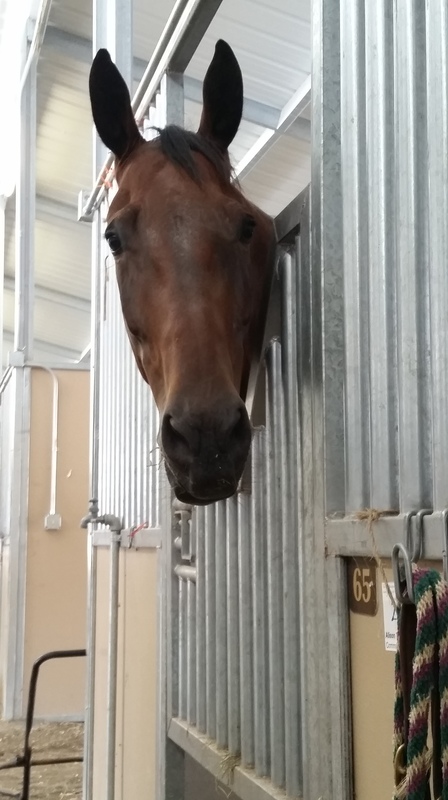 Ike checking out the show barn. Ike and I just survived our third licensed show of the year. Three down, three to go. Overall, I am thrilled with how our season is progressing, but as always, the perfectionist in me wants more. But that must be tempered with reality. Horses and showing are my hobby not my vocation. I need to stop comparing my skills and performance against those who do it for a living. I ride one horse four or five times a week. I have a full time job, a house to maintain, a husband, dogs, family and friends. I have (shockingly) other hobbies. I also fight middle age aches and pains and fight my body when I ride. Why won’t my body do what I want it to do?? 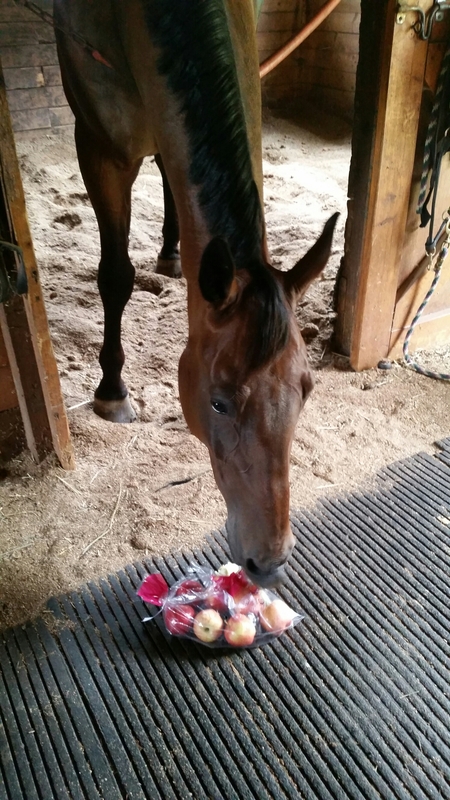 In spite of my issues, Ike continues to learn and progress – a testament to his rideability and good nature. It makes me realize that I did chose the right horse four years ago. In fact, it was four years ago yesterday that Ike first stepped foot on Virginia soil and then promptly on my foot. My first photo with Ike when we met in Florida. Sometimes it seems like it was just yesterday when I first threw my leg over his back. But then I look back at photos and video from those early rides and realize that we have made progress. He has grown 5 inches at the withers (yes, that is the correct number) and put on a few hundred pounds of muscle. Ten meter canter circles are now a reality. Ike can now ride a straight line instead of looking like a worm wriggling down centerline. I can actually execute a half halt and he knows what it means…even if he doesn’t always respond. We are still in the early, formative years of our dressage education. The work we do now will determine how far we can go in the future. There is still much work to do with building strength and stamina in our collected work. Comments from this past weekend’s tests tell us that we need to improve our lengthenings and medium gaits. “Show more change.” I thought we were? “Out behind” was written more than once. We will fight that forever based on Ike’s conformation, but I need to help him use his body better. Time and patience. I am not a very good grasshopper. We came home with one blue and two red ribbons. Even more importantly, we had our best score ever at First Level Test 3 at a licensed show, and cleared 60% at our first attempt at Second Level Test 2. I think my favorite comment on my Second Level test was “Good effort. Keep working on developing the gaits for more expression.” It was nice to know that the judge acknowledged that we were trying our hardest to show her our best. In all our tests, our best scores came from our lateral work. I was tickled to get such solid scores on our shoulder in and travers! 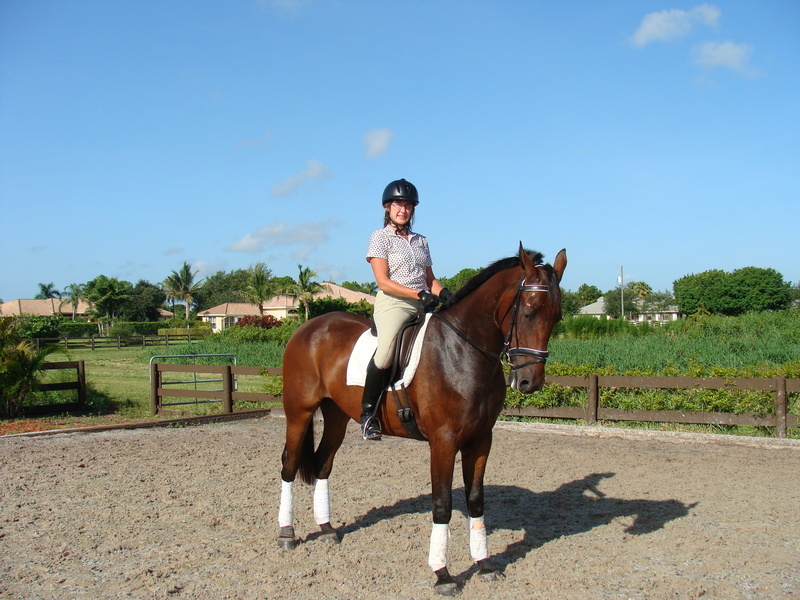 Our collected trot still needs more oomph, our collected canter needs more jump, our medium gaits need more of everything, and our canter-to-walk transitions are then only part that needs less (trot steps that is). Our turn on the haunches? Let’s just say that our scores were better than the Fix-a-Test, but that there is still A LOT of work to be done. If you really need to know the blow by blow of my tests, the show’s website now allows you to see the individual movement scores. Talk about TMI – no secrets anymore. Our canter work in First 3 also got good marks from the judge; what a difference a year makes since it was at this show last year that I had my melt down about our inability to ride the canter loops. It gives me hope that we can head to the GAIGs in October and stand a chance at making a good impression at the regional finals. And, yes, there was to be another Second Level test on Sunday, but I decided that there wasn’t going to be enough juice from either of us to put forth our best effort. Why put ourselves through the agony of a bad ride? And after seeing my scores and comments from the day before, I knew there were not going to be any miracles 24 hours later. So it was best to pack up and let Ike go home for a peaceful afternoon in his paddock. The other significant take away from my Saturday ride was that we are definitely not ready for Second Level Test 3. I had optimistically signed up for Test 3 at the 2 one-day shows in September thinking that I’d miraculously get my qualifying scores and ride in the Second Level championships as well. Of all the voices in my head, the realist finally screamed the loudest and said, “rethink this nonsense!! !” Sigh, I did. We changed our classes to the First 3 test. We will still try Second 1 and 2, but we will save test 3 for a later date when we both are a bit more confident in our collected work. I can hear Master Po saying, “More patience grasshopper” so many times that he is forced into early retirement because he has gone mad. Enjoy the final weeks of summer my friends! If the bag has 8 apples in it and I am expected to share half of them with my brother, how many apples do I get? Eight! He can’t reach them and I think I can eat them all before Mom catches me.